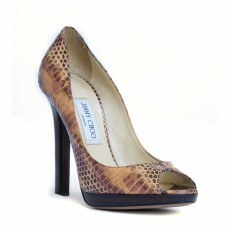 Elevating your look, heels have taken fashion to higher grounds. Not only making any dry and drab outfit look chic but also adding a feel of sophistication and style to your walk. Our curation of heels come in all shapes and sizes, pointed toe pumps to peep toe platforms, from studs and buckles to glitter and animal print heels, we have it all. Shop for the refined construction of women’s heels by Christian Loubutin and Jimmy Choo, and you won’t want your feet to ever touch the ground. The perfect pair of shoe awaits you! Luxury brands have been upping the ante by using bold and unconventional materials such as the classic black or white patent leather, fabric, snakeskin and even soft acrylic to create one of kind products. Constructing artistic and sculptural pieces that help you express your unique personal style. Pre-loved heels from all the loved brands can be found in our prized collection.